What is it about pot pies and their foreign cousins  pasties, tamales, calzone  that makes us feel all snuggly and satisfied? Here at the outer edge of Hayward, amidst a frontier of freeways, ducks, and sky, stands one of those rare restaurants that defines itself not by genre or aura or ethnicity but by the shape and state of what it serves: stuffed and circular. 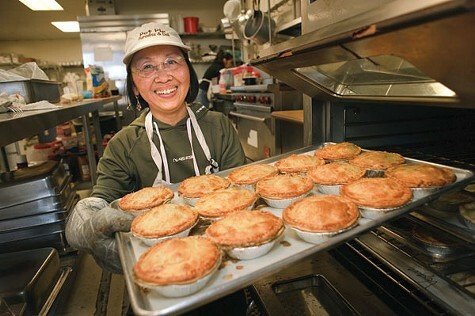 Theresia Gunawans dozens of pot-pie varieties span the globe: Fricassee pie. Tikka masala pie. Tempeh pie. Gumbo pie. Goulash pie. Chicken-cacciatore pie with rice-shaped orzo pasta. Osaka-beef pie with soy sauce and sake. Beef-and-egg-noodles pie. Lime-lamb pie. Raised in Indonesia, Gunawan labors under no cultural conviction that flaky Western-style crusts nestled inside Western-style metal pie pans are obliged to contain peas, carrots, and chicken chunks  so her oeuvre is an ever-shifting crust-encased Its a Small World. Soups, salads, and sandwiches augment the pies. Extra Info: No MSG, no hydrogenated oils, all natural ingredients.